Up to last November I often gazed at at some of the big names of the McGillycuddy’s Reeks and wondered when I would ever get to climb them. In particular I was looking at The Big Gun & The Bones. 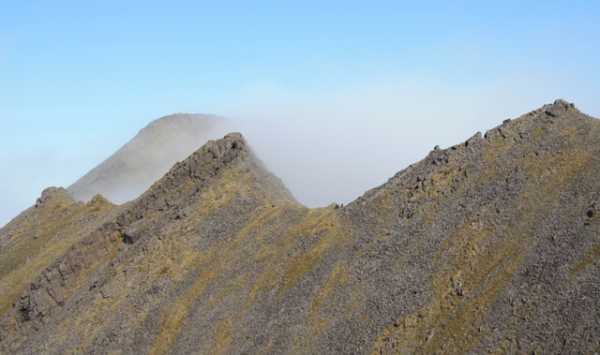 Both are situated in somewhat precarious positions – The Big Gun lies elusively on the narrow ridge between Cruach Mhor and Cnoc Na Peiste, and requires a scramble across this ridge from either of its giant neighbours. 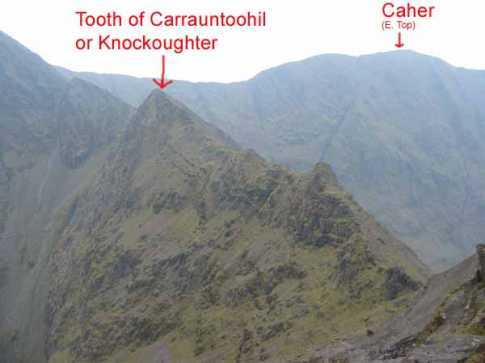 The Bones is situated on the narrow ridge between Carrauntoohil and Beenkeeragh, and similarly requires a scramble across from either of these giants. Not being one who is particularly fond of narrow, rocky & harrowing ridges and arêtes, I knew I could be waiting for a long time before I would stand on these summits. Thanks to the MountainViews Scavvy walk last November I managed to reach the summit of The Big Gun and the rest of the 900’s in the Eastern reeks. 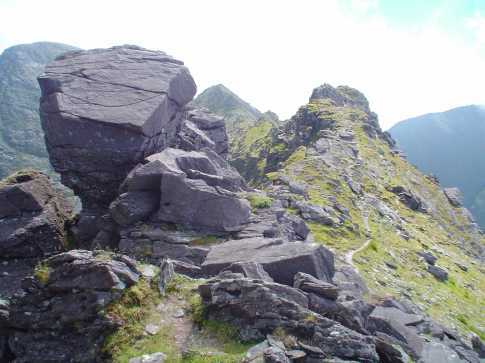 This left only The Bones in that small list of 14 summits that poke above 3000 feet in Ireland. This weekend I was part of a scout group that intended to climb Carrauntoohil. MountainViews member Jackill kindly agreed to accompany us in order to look at the possibility of taking me across to The Bones and back to Carrauntoohil to rejoin the group for the homeward trek. Saturday dawned the most fabulous day ever, with clear skies and an ever present cloud inversion for miles around. 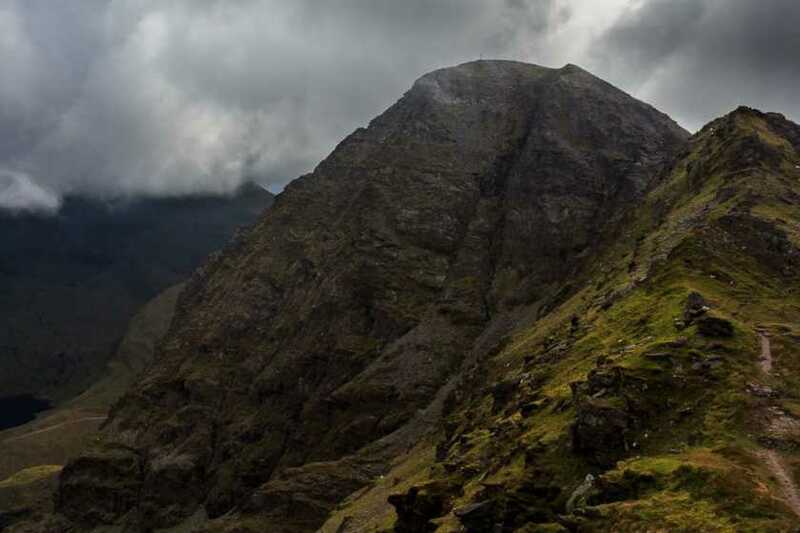 The group reached Carrauntoohil via Caher in record time, and we gazed in awe at the various mountains peeking out of the cloud around and below us. Our scouts were in good shape and in good spirits so we made the decision to bring the whole group across the Beenkeragh Ridge to join me on my quest. And so it was that our scouts were the first in their Unit’s history to complete the Coumloughra Horseshoe, when we decided to carry on over Beenkeragh and return to the Hydro Road via Beenkeragh. 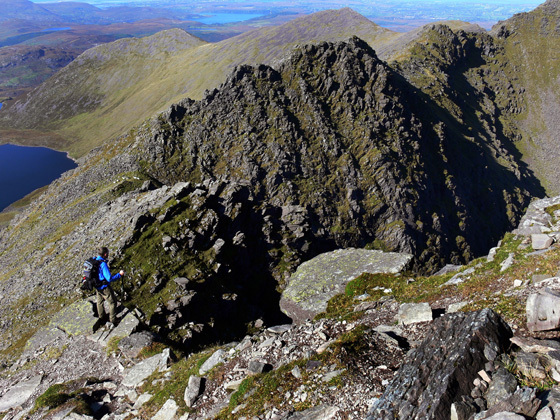 The Beenkeragh Ridge and The Bones summit are a serious challenge, and several sections require concentrated scrambling. With the support of 5 leaders (including honorary 112th Knocklyon leader Jackill) we saw our 12 hardy scouts safely across. Slow and steady was the mantra, and we saw the best of mutual assistance given and received by the scouts as they helped each other with practical tips and psychological support. They say true bravery is doing something you are scared to do, and we saw the bravest of people that day. We camped in Killarney on Thusday night to get an early start on Friday morning. The plan was to take in the Coumloughra Horseshoe.We started at 9.30 am and finished at 5.30 pm.